And then there's the one I was really looking forward to doing: lower the car without having to buy anything. ​While MMI allows you to input data while driving, it always displays a warning message prior to you doing so where you need to click 'OK'. This mod removes that warning. ​Below a good video showcasing how it works. Use this hidden menu at your own risk. I haven't really used it yet or dug around much in it. For lowering the car, it's stated you need to go in here and change a value, but upon inspection, that value was already set correctly for me. 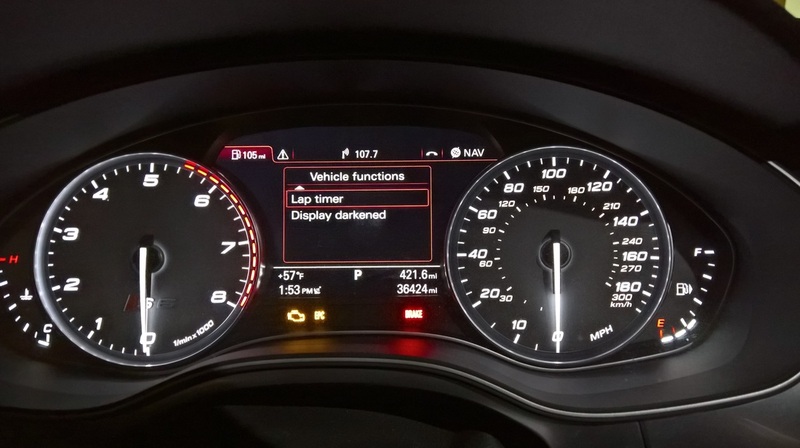 Caution: Keep away from the "Bootloader"
Leaves the low beams off when unlocking the car and just have the DRLs on when its dark outside, similar to some other Audis. Much cleaner look. 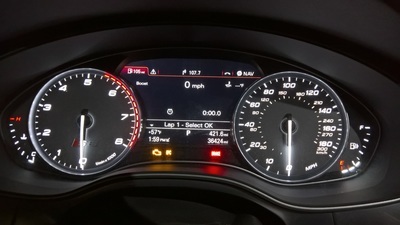 Bit 3 - Check the box for "Lap Timer active"
​Even if you're not looking to track lap times, when in this menu you can see oil temp, a shift 'light' (a meter that builds up to the shift point), and a boost gauge (no values, just gray vertical bar). ​After enabling this coding, select the lap timer function via your left steering wheel menu control, scroll, and select (see pics to left). ​Once the car is up to temp, you will see a gray boost bar build vertically on the left side of the DIS. 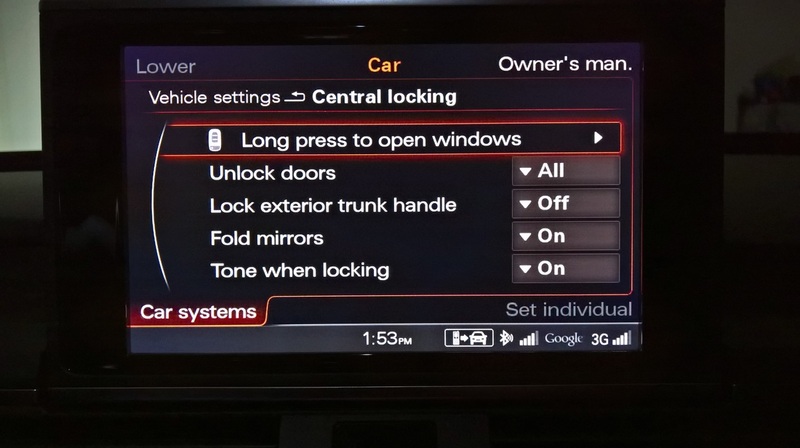 Additionally, if you put the car into manual, you'll now get a shift light functionality via a gray horizontal bar which will fill green as you get near redline. The video below (not me or my car) showcases the boost bar and shift light very well. Both Bit 1 and 2 were previously checked. ​It's a fairly detailed process, but if you follow it step-by-step, it should work. Thanks tons to TunTap on AZ for figuring this out! The below is just edited text from his post on how to do this. 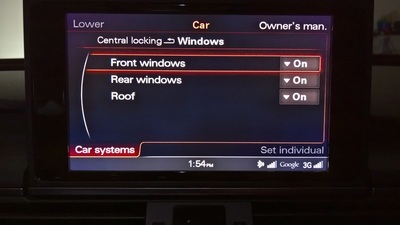 Set your car to "Auto" mode (not dynamic, comfort, etc.) and make sure it's on level ground. Close doors. If any doors are opened during the procedure, it will be interrupted. 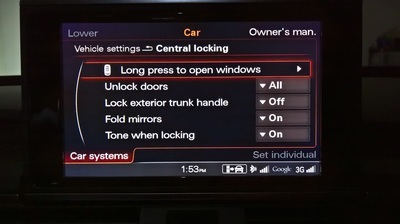 Make sure your car is NOT in a towing or tire changing mode. 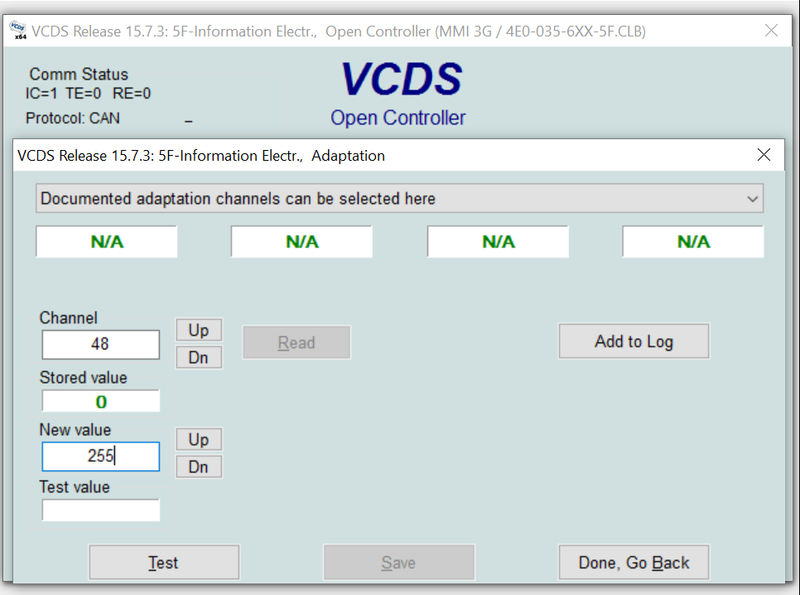 Load up VCDS, go to Module 34 - Level Control, and go to "10 - Adaptation". 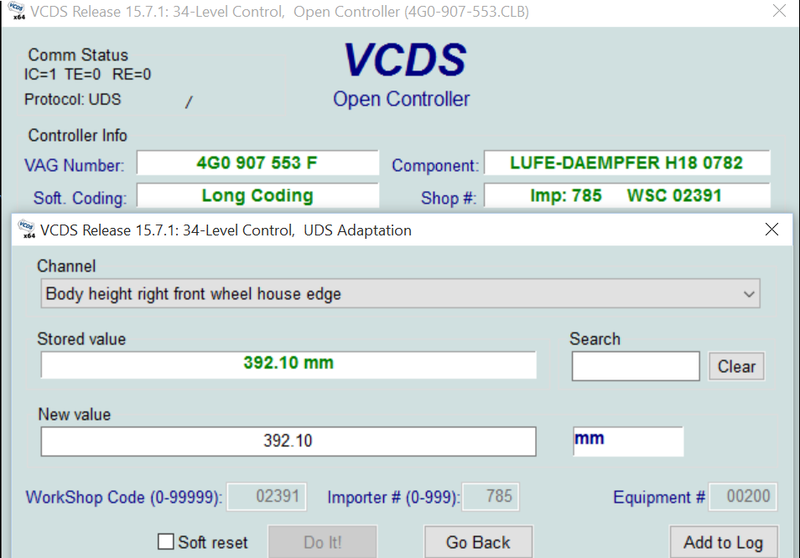 Write down the 4 values titled as "Body height front left wheel house edge" . I just built a small table. 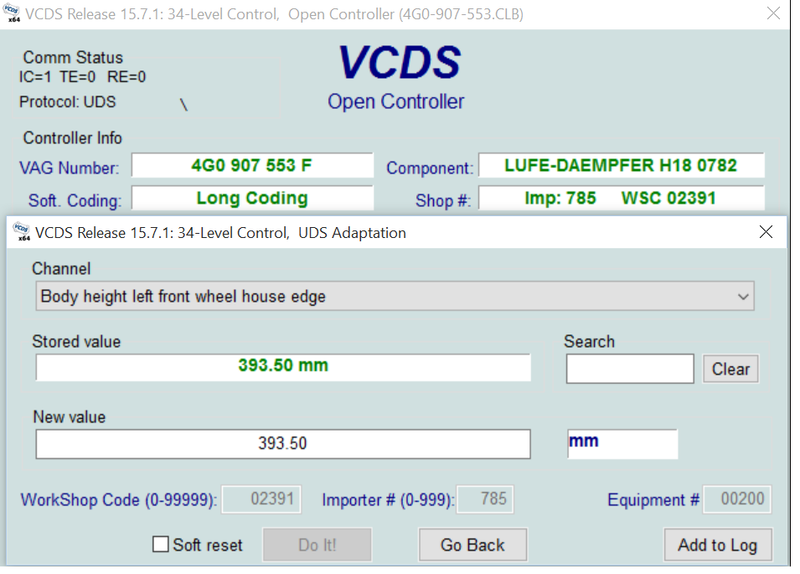 Now ADD your desired drop in millimeters (mm) to each value. 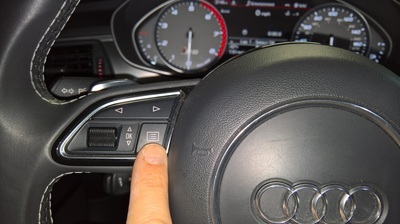 Note that maximum Audi-approved drop is 17mm. 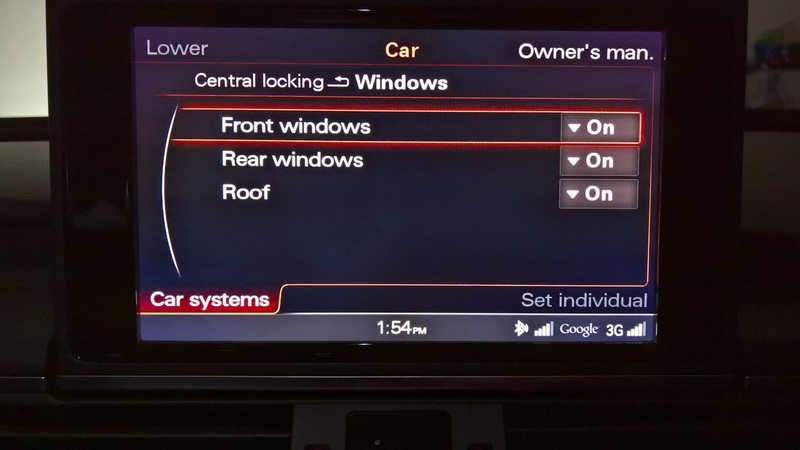 You may be able to go lower, but if you do, you're also affecting other systems, such as cameras, adaptive cruise, etc., so be careful. 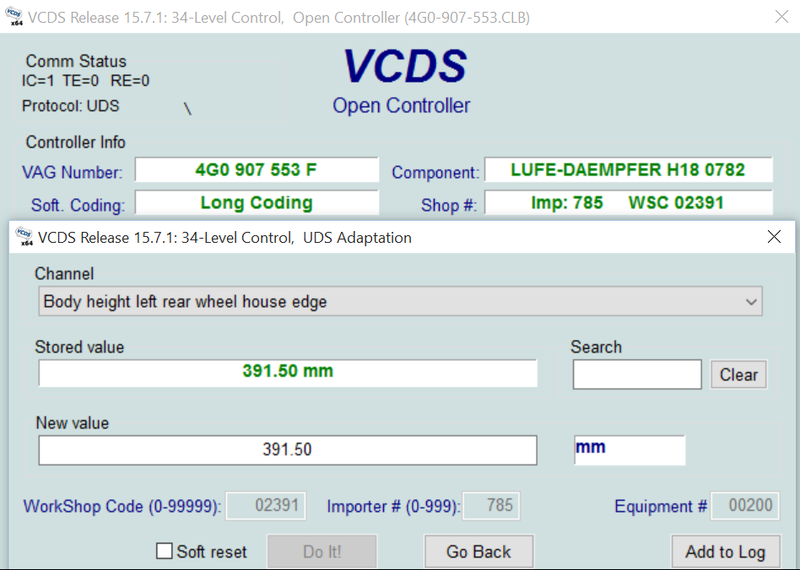 (Note: Technically, if you want this procedure to be done properly, instead of taking existing values, you will measure all 4 wheels after completion of the step 7, and then add your drop value if desired. 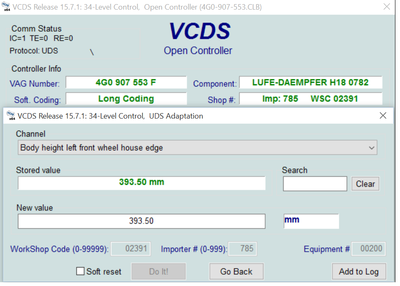 Suspension height values are measured from the center of the wheel to the edge of the fender.) At this point you should have something similar to the table up to the right. Go to Security Access and enter code 20103​. You should get a message stating that security code has been accepted - if you don't, something failed, stop doing what you're doing​. Select "Activate Level Control", hit "Go", wait for it to complete (should only take a second, until it says "not running"). Select "Delete Calibration For Level Control", hit "Go", wait for it to complete, your car will throw a fault code and you will see an error message stating Air Suspension Malfunction - this is normal. Select "Start Up to Reference Level", hit "Go". This step will take about a minute, and your car will go up/down during the process (you'll hear hissing noises). Wait for it to complete, until it says "not running". DO NOT use the "start up to reference level production" option. 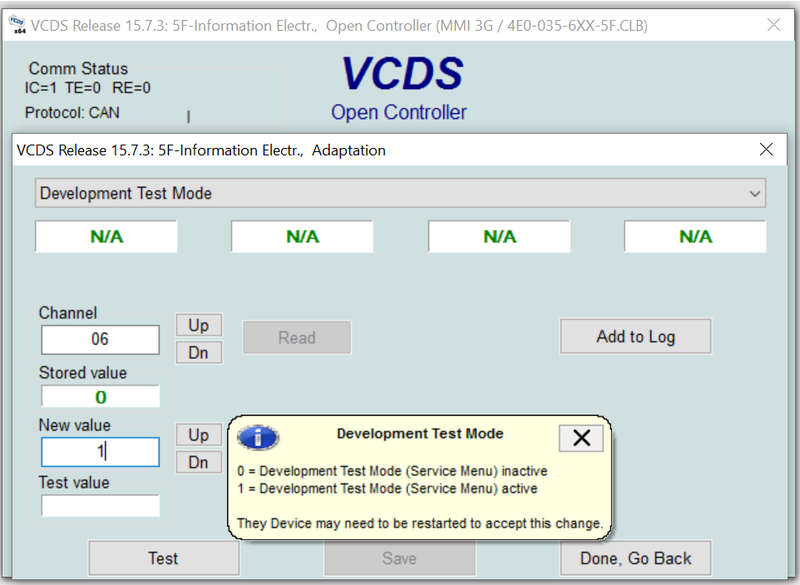 Select "Go Back", go to "10 - Adaptation" on the previous screen. Enter new adaptation values for all 4 wheels. 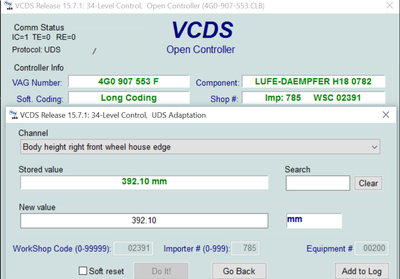 Select "Body height front left wheel house edge", then enter new adaptation value from your table, and hit "Do it", then repeat for the other 3 wheels. 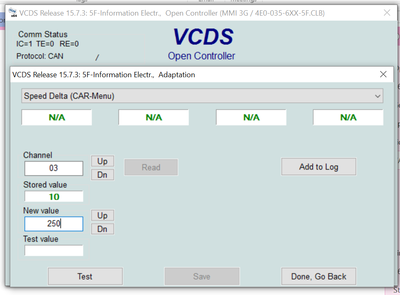 Each time you enter a value, you should get a message stating that it has been accepted. After you're done entering adaptation for all 4 wheels, select "Go Back", and return to "04 - Basic Settings" again. In basic settings, select "Calibrate Level Control" and hit go, it will take a few seconds. Wait for it to say "not running". If you get an error during this step, you either missed a step, or something went horribly wrong. 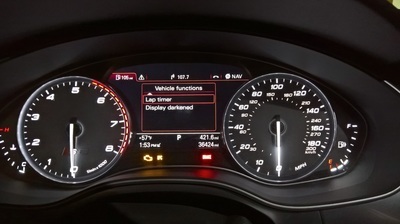 Select "Activate Level Control", hit "Go"
You're done, now go to "02 - Fault Codes" and Reset codes. Change the value to "5"